As 2018 is proclaimed the “Year of the Bible” in Ukraine, Lutheran youth and teens are receiving their own Ukrainian-language Bible Stories in Pictures from the Lutheran Heritage Foundation. 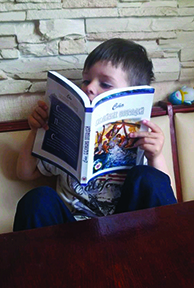 LHF has translated and printed 1,000 copies of the colorful Bible storybook in the Ukrainian language. Laid in a comic book style, its 350 pages include 94 Old and New Testament stories with text taken directly from Scripture. Rev. Slavik Horpynchuk, bishop of the Ukrainian Lutheran Church, has been enthusiastically overseeing the distribution of the book throughout Ukraine. Throughout history, Ukraine has had a rich tradition in the Christian faith. However, generations of oppression by the atheist Soviet regime throughout much of the 20th century took its toll on the faith of the people. The ideals of communism left no room for religion, and under intense persecution, many Christians abandoned their faith. The effects of this imposed atheism are still being felt decades later. The Ukrainian Bible Stories in Pictures has also made an impact at the highest levels in the Ukrainian government. The book was printed just in time to be presented to the Ukrainian Parliament’s Committee on Foreign Affairs, where the chairwoman, Hanna Hopko, is a practicing Christian.